This PIONEER BCS-HF828 2.1 home theater system pursues good advantages: a good fire power (over 500 watts), HVT speakers and omnidirectional versatile unit capable of juggling with Blu-ray 3D and multimedia files. This pack PIONEER BCS-HF828 2.1 is made for those who say they do not have enough room for a home theater at home. 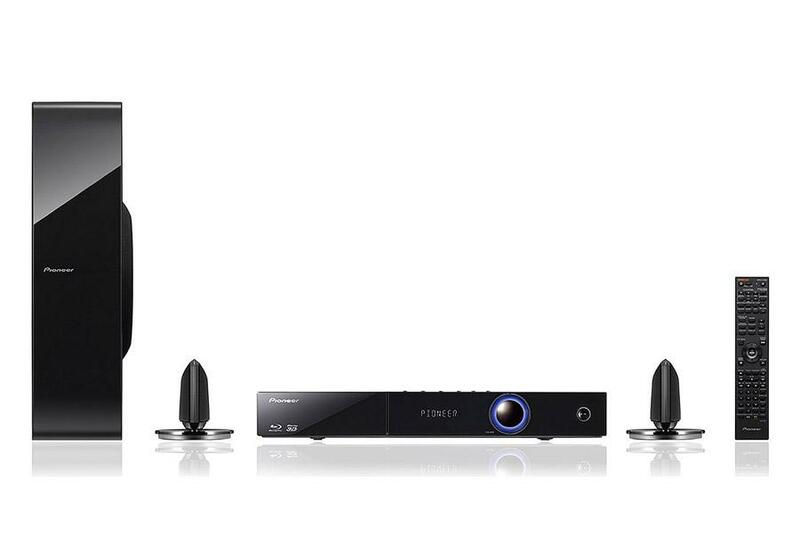 PIONEER BCS-HF828 is conceived and designed to fit into a living room, HVT speakers and omnidirectional versatile unit capable of juggling Blu -ray 3D and multimedia files. The question now is what really is in this system. What surprises the outset, it is the size of the satellite speakers. They are tiny, to the point that one wonders how they can offer good sound. It is double-sided omnidirectional speaker technology operator HVT (Horizontal Vertical Transforming). Simply put, the Pioneer engineers have modified the conventional operation of an enclosure to reduce the thickness and volume necessary for their operation, while providing a sound diffusion at 360 °. It is not necessary to keep directly in front of the screen or place the speakers with precision in each corner of the room to get its surround. It works in all cases. They are also backed by a subwoofer, also rather quiet (13 cm thick), which can be positioned vertically or horizontally. It is also the surprise side of the loudness. On paper, this PIONEER BCS-HF828 2.1 system offers 150 watts x 2 at the front and 250 watts for the subwoofer. It’s much the same for a small group like this. In practice, one realizes that pack 2.1 a trunk and reserve. Pioneer has also added several spatial modes whose mode Sound Wing which offers a slightly raised additional mode Virtual 3D and multiple listening modes preset focusing either on voice or on music, either on the bass, etc.. A little gadget, but it can be useful. Multimedia side, we also appreciate the range of opportunities available in PIONEER BCS-HF828 with Wi-Fi, with two USB ports, the iPod / iPhone dock, certification and DLNA function Home Media Gallery. This allows you to use the device as a media gateway and read just about everything and anything. However small precision for Flac files that are not supported via the network, but only through the ports USB. No compatibility problems, however, since most video formats are supported up to 1080p HD (AVI, DivX, MKV, WMV, MP4, etc.). Note also the possibility of direct access to YouTube and Picasa, function rip CD to USB, and the ability to add a Bluetooth adapter for streaming audio from a smartphone or tablet. 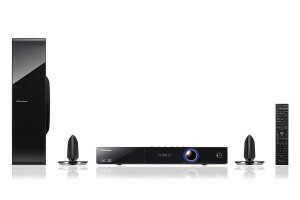 Good news in PIONEER BCS-HF828, the CPU accepts Blu-ray and SACD. But do not expect a great musicality of its hand. This system is primarily built for the show and to produce sound. And on that front, it is rather satisfactory. Capable of decoding and return to the sauce, the tracks of our HD Blu-ray, this set shows Pioneer nervous, muscular in the lower and produces a damn big. It may lack a little detail, finesse and precision on the tracks and dialogued, but it is wide enough for evenings and juicy home theater or family. However, it is wise to make tests before finally placing the speakers in the room. Station including wall reflections which have the advantage of offering a pleasant scale of music, but also affect the accuracy of the rendering movies. We also recommend that you place a rug on the floor between the speakers and the sitting position and to provide rear absorbent materials (curtains, draperies, etc.). Impressive compactness and nervousness, this small PIONEER BCS-HF828 home theater system 2.1 is very interesting, but needs to be controlled. This implies to choose the location of the speakers and subwoofer, and work the room acoustics in order to limit the acoustic reflections. For these small speakers are still fairly dry and spicy in the treble. No problems noted on the video, and multimedia section is impeccable. Too bad the price is a bit high. Overall, we will recommend you PIONEER BCS-HF828.